A hidden lake around 20 minutes from the strip of Las Vegas; if you’ve had enough of all the noise and partying this could be the perfect escape. The special thing about this Lake is that it’s man-made and is surrounded by a residence as well as a local sports club, tennis courts, Golf courses and much more! Lake Las Vegas has had its ups and downs over the years, the golf course even turned brown at one point although it is currently doing amazingly well and has some astonishing houses. There are some great spots around the lake to go Paddleboarding, one of our favorites is the Reflection Bay Golf club. If you are looking for a bit of time to yourself this is the ideal spot as it usually pretty quiet. With a beautiful white sand beach and guaranteed Sun what could possibly go wrong? Also if you are feeling hungry take a look around the golf club as you may have missed the café which serves your usual wraps and sandwiches as well as a nice cup of coffee. If you don’t have your own SUP you can also rent one from the Golf Club; there aren’t any signs which are probably one of the reasons this place is still so quiet, but we aren’t complaining! If you have the time and money we would highly recommend spending a day having a game of Golf and/or Tennis as well as disappearing to the other side of the lake to enjoy some relaxing time on the water, don’t forget Las Vegas SUP and Kayak club on this side so you don’t necessarily have to travel to the other side (information below). If this is your first time visiting Monte Lago Village resort but don’t worry you will be amazed by the pure beauty of the resort. 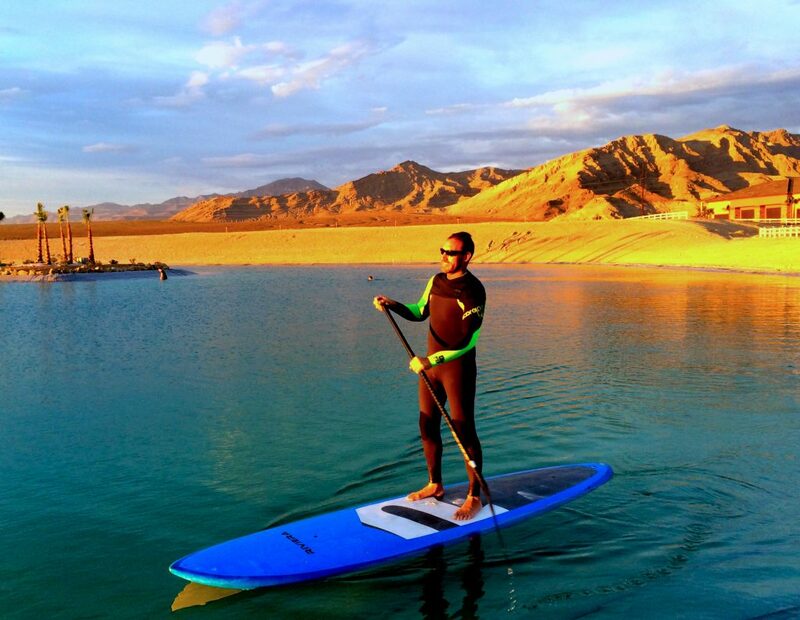 Las Vegas SUP and Kayak club are also on the other side of the Lake for any inexperienced Paddle Boarders. They have an astonishing 5-star rating on Facebook from 87 reviews and a 4.8 out of 5 rating on yelp. Professional trainers will help you improve your SUP skills no matter what level you are at as well as offering canoeing experience should you want to try something different. Their sunset paddleboarding which includes neon light and glows sticks and can only be described as magical. The staff is very friendly and willing to help you with any problems and at $40 it isn’t overpriced for the 2 hours of fun you are pretty much guaranteed. Stand-up Paddleboarding is spreading by the minute, you no longer have to live by the sea to get the opportunity at paddling! This is a perfect example of that, in the desert state of Alabama you can even find a place to go SUP(ing) does it really matter if the Lake is man-made? We hope this article has helped you find a nice escape from the city and don’t forget to check out our article on Paddle boarding in the Grand Canyon!